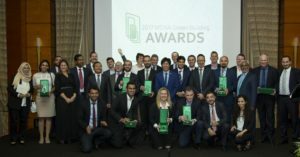 Emirates Green Building Council (Emirates GBC) on May 17 recognised and honoured innovation, creativity and excellence in promoting sustainability best practices during the 2017 MENA Green Building Awards in Dubai. According to Emirates GBC, the awards exercise attracted record submissions from six nations across the MENA region, which the body said, highlighted the growing focus of industry stakeholders to promote innovation and best practices to drive sustainable built environments. HVAC companies, Daikin and Edmonds were among the winners that were honoured during the ceremony, attended by government officials, industry leaders, representatives of academia and media. The two companies won in the ‘Green Building Material/Product’ category. Daikin won the award in the sub-category, ‘Energy Management’ for its Daikin inverter R-32 split system. Edmonds won the award in the sub-category, ‘Indoor Air Quality’ for its Edmonds Eco Power Hybrid Ventilator, Synergy United. Supported by the World Green Building Council (World GBC), the Awards was organised by Emirates GBC in partnership with the Jordan GBC and Lebanon GBC. A panel of 12 judges from the region, including members of the MEP and building performance communities, evaluated the submissions. KPMG was the Official Observing Auditors of the evaluation process.